How do I replace the ink cartridges? Make sure you have replacement cartridges handy before you begin. You must install new cartridges immediately after removing the old ones. 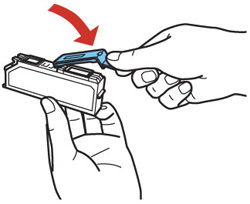 If you remove a low or expended ink cartridge, you cannot re-install and use the cartridge. 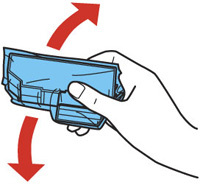 If an ink cartridge is expended, you see a message on the LCD screen. Note which cartridges need to be replaced and press the OK button. Select the option to replace the ink cartridge and press the OK button. If you are replacing a cartridge before you see a message on the LCD screen, select Setup > Maintenance > Ink Cartridge(s) Replacement. Press the OK button and the start button. 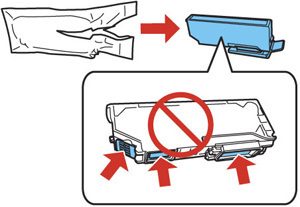 Remove the cap from the cartridge and save the cap so you can recap ink cartridges before storing or disposing of them. 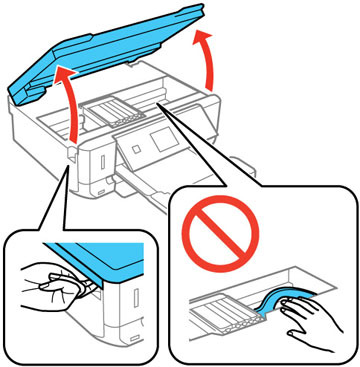 Insert the ink cartridge at a slight angle into the ink cartridge holder as shown. Then press the bottom of the ink cartridge down until it clicks into place. After you replace all the cartridges that need replacing, close the scanner unit and press the start button. The product starts charging the ink. This takes a few minutes. When you see a completion message on the LCD screen, ink replacement is complete. Note: If you see an error screen telling you an ink cartridge is installed incorrectly, repeat steps 3 and 4, and then remove and reinsert each ink cartridge until it clicks into place. When you’re finished, close the scanner unit and press the start button.